I've mentioned before about the group of guys who are friends and have worked together at one time or another since we moved to the Bay Area in 1993. You may recall that dot-bomb fiasco in 2000? At the time all 5 of the guys were working at the same place and all were...well...lets just say..."required to find other employment". So they formed their own contracting company called Purple Magma. A bit of a take from Austin Power's "Liquid Hot Magma". They're all working at other companies now, but since we're all friends, Purple Magma still remains a part of who we all are. Since the company has formed, we've had 2 more marriages and 6 babies. 2 more babies are on the way soon. The youngest is 17 months, the oldest is 6 years old. Travel back in time four years ago when Jimmy and I had a New Years Party at our house. At the time, there were only 3 babies. 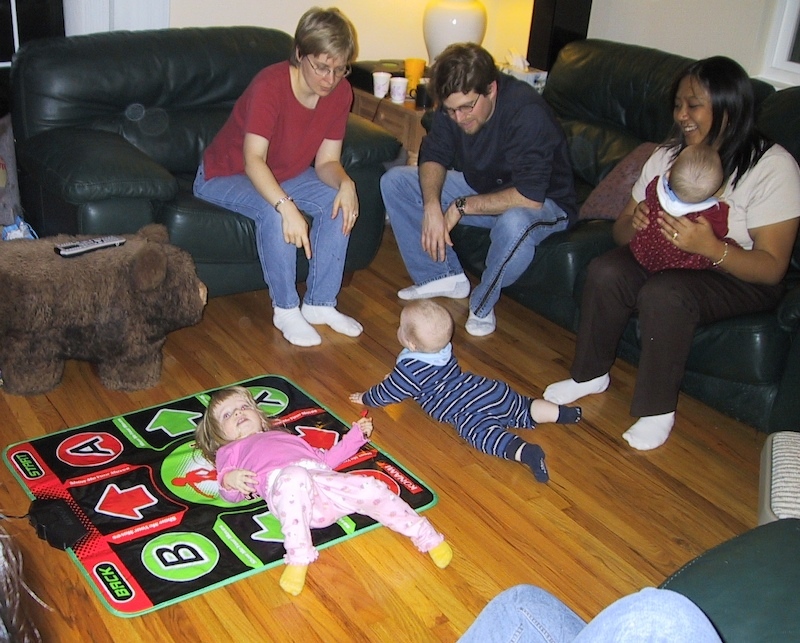 The oldest in the photo above is the 2 year old on the DDR mat. The babies are the twins left of center above, and are almost 5 years old. Well, this year, we kind of kept to the xbox (360 this year) theme of interactive games. 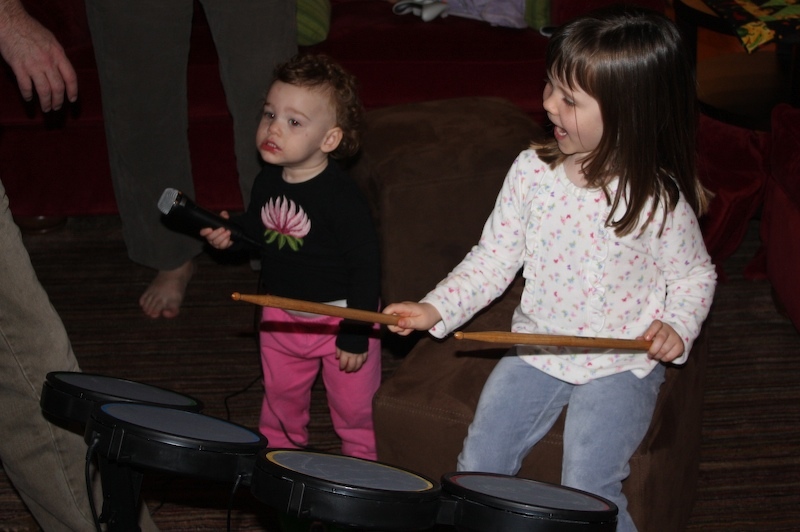 We rocked out to Rock Band. 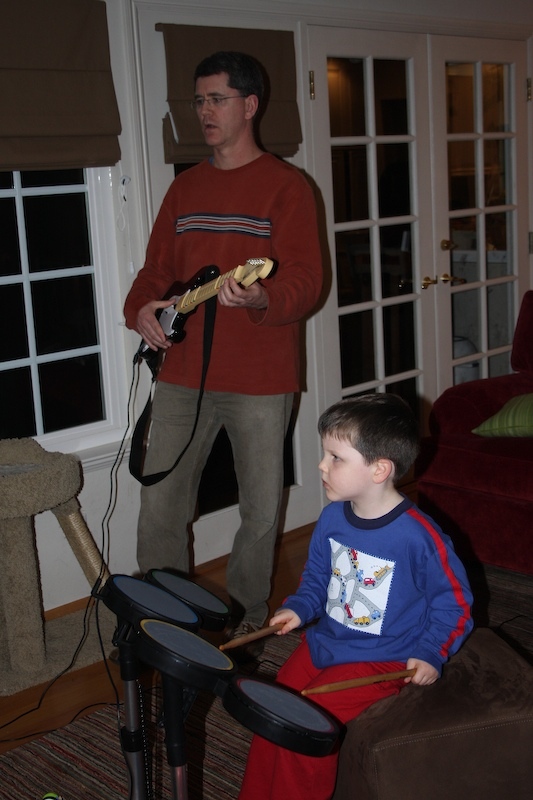 Jason and his son rock out to Nirvana's "In Bloom". Then Baby Brewer and Chancey daughter rocked to Mountain's "Mississippi Queen". Great pictures of people having lots of fun! 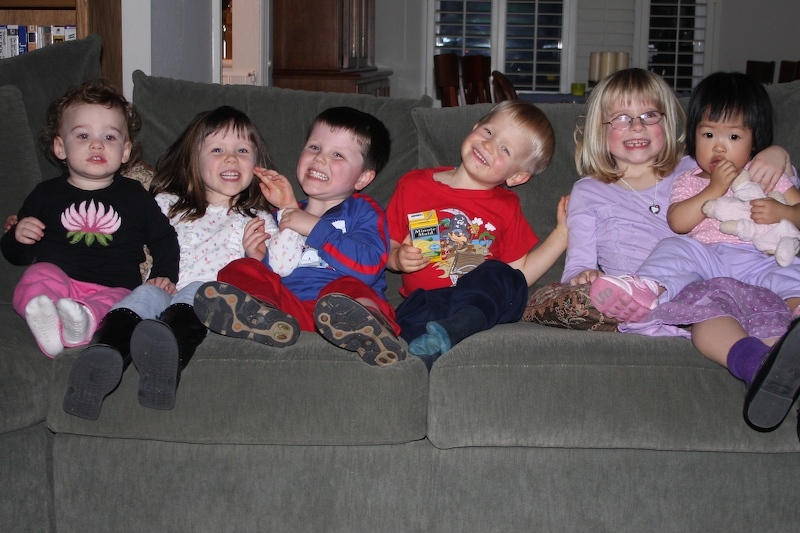 And I love the picture of all the kids lined up on the couch. 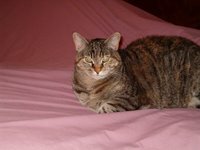 Are you experiencing any effects of the huge California rain and wind storm that I have been hearing about on the news? What a nice trip down memory lane. I love the pix on the couch! I hear rock band is a great game! nice pics! AAAh those kids are so cute, the future of America. The kids look like there having a great time playing.